One of the best ways for employers to kick off the new year is by attending San Diego Employers Association’s (SDEA) Annual Employment Law Update. 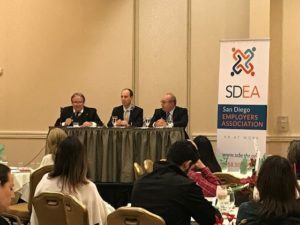 This year, SDEA brought together three of San Diego’s top employment law attorneys – Chris Olmsted with Ogletree Deakins, Rich Paul with Paul, Plevin, Sullivan & Connaughton and Lonny Zilberman with Wilson Turner Kosmo – who presented the latest laws, cases, and lessons of relevance for employers in San Diego. For those who were unable to attend, we’ve put together a handy recap of the key take-aways every employer needs to know in 2019. In the California Legislature, 2018 was a year for sweeping changes impacting small and large employers alike regarding sexual harassment prevention. Changes to mandatory harassment prevention training, confidentiality of settlement agreements, privileged communications, and multiple changes to the Fair Employment and Housing Act (FEHA) related to sexual harassment and harassment prevention. Starting with SB 1343, the mandatory training requirements for harassment prevention training have expanded. Prior to 2019, employers of 50 or more employees were required to provide two hours of Harassment Prevention training to supervisors every other year. The Legislature changed the mandatory training beginning January 1, 2019. Under SB 1343, employers of 5 or more workers must provide sexual harassment prevention training to all employees by January 1, 2020. Supervisory employees must receive at least 2 hours of training every other year based upon the required topics mandated by the state. Non-supervisory employees must now receive at least one hour of sexual harassment prevention training every other year as well. The Legislature directed the Department of Fair Employment and Housing to provide training, but that has yet to appear in anything but draft form. Newly hired nonsupervisory and supervisory employees must receive training within 31 days of starting employment. Newly promoted supervisors must receive training within 6 months of being promoted. SDEA has a number of supervisory and non-supervisory trainings scheduled to assist businesses comply with the new requirements. SDEA also provides on-site, semi-custom training if desired; contact SDEA for on-site pricing and availability. With the pervasive impact of the #MeToo movement, many employers provided training to all managers and employees in 2018, before the mandate began. The state has provided conflicting answers regarding whether 2018 training can be used to meet the deadline of 1/1/2020. The DFEH’s FAQs say that only training provided after the mandate will “count” towards compliance. The law itself is “silent” in this regard. Expanded personal liability as a separate offense related to parties who retaliate against those involved in a claim of harassment or hostile workplace. Sexual harassment reporting prohibitions and nondisclosure agreements related to sexual harassment in other employment agreements and contracts are now prohibited. Agreements silencing employees are no longer permissible. While behavior may no longer be “shielded” or “gagged,” any settlement amount does not need to be disclosed. This law was enacted to protect certain parties from defamation lawsuits by alleged harassers. Specifically, protected parties include complainants, witnesses and employers and written statements they may create or keep as privileged information and documents. Under the existing law, there is a state wage replacement benefit for workers who take time off to care for a seriously ill family member or to bond with a child within one year of birth. The new law related to Paid Family Leave which takes effect on January 1, 2021, includes time off to active military duty of individual’s spouse, domestic partner, or child. This was an amendment clarifying an earlier law prohibiting salary history inquiries and requiring employers to provide a “pay scale” to applicants upon request. This clarified who is an applicant, what is a pay scale and when does an employer need to disclose that pay scale. An applicant is an external party seeking employment, not an internal applicant. A pay scale is the salary or wage range for a position. The pay scale request need only be provided only following an initial interview with the company. Also, this law clarified that employers may ask for desired salary or salary expectations on an application, in an interview, etc. This law requires that certain publicly held companies headquartered in California have at least one female Board member by December 31, 2019. The penalty for failure to file Board Information starts at $100,000. This law specifically codifies that lactation accommodations must be provided somewhere other than a rest room, and in close proximity to an employee’s work area. Temporary locations are allowed under certain conditions. In another amendment to a recently passed law, the Legislature clarified that inquiries into expunged/sealed convictions are only permitted for certain types of convictions. The existing law allowed certain inquiries, but sealed or expunged convictions are generally not allowed, with stringent exceptions. Yet another amendment to recent legislation holding contractors financially responsible for nonpayment of wages to the employees of subcontractors. This law explains when and what may be withheld by a contractor in this regard, and also that contractors are excluded from the fines, penalties and interest that may be incurred by a subcontractor. For those covered by the City of San Diego’s Minimum Wage ordinance, minimum wage increased to $12/hour effective 1/1/2019. New Minimum Wage postings are also available at the San Diego Treasurer’s site. For those in California but not subject to any other local or county minimum wage ordinances, the statewide California minimum hourly wage for 2019 is $12/hour for employers of 26 or more employees; $11/hour for employers of 25 or fewer employees. Minimum exempt salary remains at two times the applicable statewide rate based upon number of employees (headcount, not full-time equivalent.) For employers of 26 or more employees, the minimum exempt salary is $49,920/year, effective 1/1/2019. For employers of 25 or fewer employees, the minimum exempt salary is $45,760, effective 1/1/2019. Rich Paul highlighted a case when a non-applicant sued for discrimination after being told no openings existed to fit her qualifications. Employers can be sued for discrimination by someone who never applied for a job, if the employer lies about the existence of an opening. Employers need to be forthcoming with applications about whether a position is open or not. Before a ruling in the spring of 2018, there were a number of tests to determine accurately classified Independent Contractors. The California Supreme Court has mandated usage of the “ABC” Test for determining properly classified Independent Contractors. The independent contractor must meet all three criteria to be classified correctly. If not, that worker is your employee! This is significant due to the large number of differences in employing Independent Contractors rather than employees. If a worker is found to be misclassified, the hiring company and the worker may be held liable for unpaid wages, unpaid taxes, meal and rest period violations, non-compliant wage statements and record keeping, and attorney’s fees. To minimize risk, it is recommended companies structure working relationships to minimize potential claims, work with vendors that have a business tax ID number, have identification clauses, and ensure consistency. Under the ABC test, it would be nearly impossible to lawfully retain a former employee on a consultant basis. Regarding the high cost of lawsuits for employers, it is important for employers to be sure that they are gathering and documenting information before the termination decision is made. It is also important that a thorough and unbiased investigation is conducted, when necessary. Employers need to think through the reason they gave the employee for termination, and be sure they are consistently enforcing policies and procedures across all areas of the company. Employers are advised to follow the “Golden Rule” of setting an example and modeling the type of behavior they want to see more of, to their employees. It is important to intervene early and be diligent in listening to complaints and concerns without “punishing the messenger.” Always be sure to document interactions and be attentive when an employee brings up a concern, regardless of your personal thoughts or opinions on its validity. Remember, complaints brought by an employee “in good faith” are protected against retaliation by the employer or coworkers as noted in some of the updated laws. It is the responsibility of the employer to process and further investigate complaints in a timely and fair manner, approaching situations with a proactive and solution-oriented mindset for the benefit of those involved as well as the company as a whole.